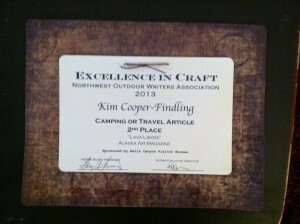 I won second place in the Northwest Outdoor Writers Association Excellence In Craft Contest, for an article in the mobile casino Camping/Travel category for 2013. The story was written for Alaska Air Magazine last summer and ran in the August issue of both Alaska Air Magazine at its affiliated Horizon Air Edition. They sent me this lovely certificate and a check for $50. Hip hip hooray! It”s the little things, you know?